The space rock that we’ve all been waiting for, 2012 DA14, is still several hours from passing by our planet, but it seems that the cosmos had something else in store as a crashed meteorite caused shockwaves in the city of Chelyabinsk, Russia. 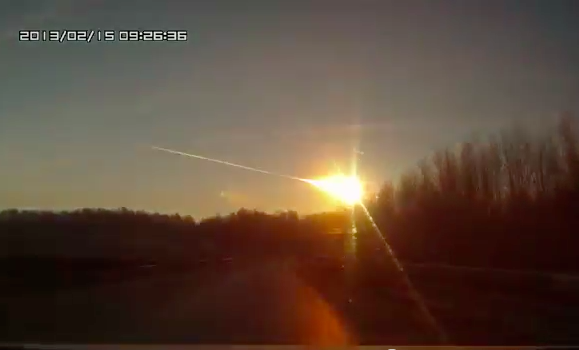 According to the videos on Russian Machine Never Breaks , the meteorite broke through the atmosphere at around 9:20am local time, crashing to Earth a few moments later. Take a look at some of the incredible videos captured by locals, both displaying the contrails streaking the sky and the subsequent shockwave from when the meteorite passed through the atmosphere. There are currently no fatalities reported as a direct result of the meteorite, but according to USA Today, at least 100 people were injured from glass that shattered as a result of the shockwave. Phil Plait, the Bad Astronomer over at Slate, was one of the first to begin speculating on the unforeseen event, claiming that he did not believe the meteorite was related to 2012 DA14 as it was traveling on a different orbit than what that asteroid is expected to travel. Hopefully, we will have more definitive information soon, but until then, be sure to check out this LiveJournal, which has a collection of dozens of pictures and videos from the event. Update, February 15, 2013: NASA confirms that the meteorite that streaked across the sky in Russia was not related to asteroid 2012 DA14. According to NASA, the Russia meteorite was about 15 meters (49 feet) across, which makes it about one third the size of 2012 DA14. It's also the largest known meteorite since the Tunguska Event in 1908. This story, "Meteorite flies over Russia, shakes an entire city" was originally published by TechHive.